Just how much does Canisius charge for tuition now, and how much can they charge down the road? How do these charges contrast with the average? Keep reading to find out. Get a full knowledge of the fees and tuition related to Canisius so that you can prepare yourself successfully for 4-6 years. Look at the stats following to understand how Canisius College's cost compares to other colleges and universities and if you should plan for tuition increases. The subsequent table outlines how Canisius measures up to other schools nationally, regionally and by state. How Much Will Tuition & Fees Be for Canisius? In the 2017 - 2018 school year, full time undergrads at Canisius were charged $36,454, prior to modifications for financial need. From this total, the expense of tuition was $34,966. $1,488 was fees. As opposed to public colleges, Canisius does not offer a tuition discount to in-state students. Fees and tuition costs quoted here do not include room and board, which will drive up your costs. However, most students will end up having to pay below full tuition after getting financial aid along with other reductions. The subsequent table outlines the costs explained above for the 2017 - 2018 academic year. How much does Canisius cost part time? View Canisius cost per credit hour here. There has been a rise of 2.1% in Canisius College tuition and fees for out-of-state students in the past 5 years. Tuition increased by 2.0% and fees increased by 2.8%. This year, undergraduates should anticipate paying $37,227 if the growth keeps up. Because of price increases, the full cost of a four-year degree will be $153,710, and the full cost of a two-year degree would be $75,243, not including additional expenses such as books, transportation, and room and board. 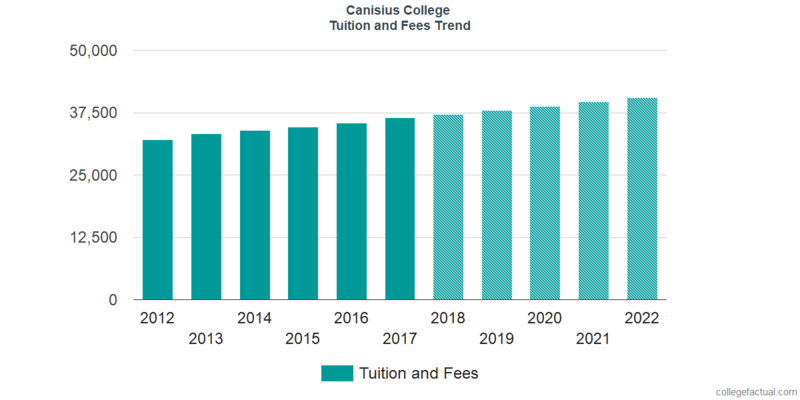 View what future tuition and fees will be for Canisius students in the following chart. Because of inflation along with other factors, the price of college tends to increase every year. For this reason your final year of college might be much more than your first year. Discover our answers to common questions and more information about college tuition and fees.